"The War that Made America" brings to life a vastly important time in American history, when events set forces in motion that would culminate in the American Revolution. 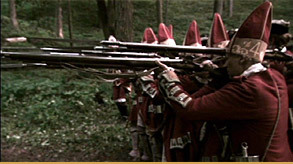 The dramatic documentary tells the story of the French and Indian War (1754-1763), which began in the wilderness of the Pennsylvania frontier and spread throughout the colonies, into Canada, and ultimately around the world. "The War That Made America" combines a commitment to accuracy with a compelling portrayal of the dangerous world of the 18th-century frontier. A central figure is George Washington, a brash and ambitious young officer in his twenties hoping to make his reputation in the military -- and whose blunders inadvertently trigger the war. A primary focus of the series, and a story that has been distorted or long forgotten, is the critical military importance and strategic diplomacy of Native Americans in the conflict between the English and French. It was a war the British won, but the fruit of their victory contained the seeds of the Revolutionary War. The program is narrated and hosted by Graham Greene, the Academy-Award nominated actor for "Dances With Wolves" and an Oneida Indian whose ancestors fought in the French and Indian War. The War That Made America is presented by WQED Multimedia.